Dave Jones talks about the power of comedy and making Shaq laugh. Find Dave Jones on Facebook or follow him on Twitter @DaveJonesComedy. As Dave Jones enters All City Kicks in Eastown, he’s wearing cargo shorts, a t-shirt, a cap and an easy smile. He greets his buddies working at the store and then settles in for the interview on a red leather bench near the front window. The air seems to lighten. This makes sense. His job is to make people laugh. Jones, 24, is a local comedian. 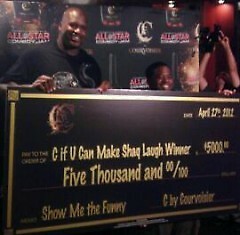 Last month, he won $5,000 in a national contest called “C if U Can Make Shaq Laugh” put on by Courvoisier. 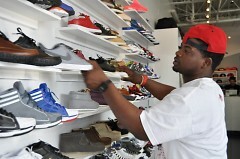 Thousands entered the contest, but Jones was one of three finalists who got a chance to perform in front of Shaquille O'Neal. “I’m always nervous,” Jones said. However, this competition had added pressure because the contestants could not watch each other, but they could hear the laughter. Jones knew he had a good chance at winning when Shaq was “laughing so hard he told me to stop,” he said. Always the class clown, Jones did his first comedy show when he was 13 at the Wealthy Theatre. He attended Central High School for three years before finishing in the performing arts program at Union High School. He did shows on and off, but is now a full-time comedian. “Comedy is powerful,” Jones said. It allows him to take situations that aren’t supposed to be funny and make them funny. For just a little while, a comedy show allows escape from a bad day, relationship problems, or trouble at work, he said. All of life is tragedy or comedy and “I like to stay on the comedy side,” Jones said. Sometimes his comedy can touch a nerve, especially when he jokes about racism, Jones said, leaning back in his seat laughing. He points out that he uses the “n-word” a lot, but he doesn’t say “n-word” on stage. “I never let a word control my emotions,” he said. Jones tries out new material on all of his friends. He works jokes into conversation to see if they get a laugh. Some comedians only focus on certain types of people or are only comfortable in an urban crowd, Jones said, but he looks up to comedians like Dave Chappelle and Eddie Murphy who reach a wide audience. Grand Rapids is a good place to practice this because it’s so diverse, he said. In addition to winning the Courvoisier competition, Jones sold out a show at the Wealthy Theatre in March. He just put out his first DVD called “Ready to Live,” and is currently planning a college tour. He hosts a comedy hour at Cheero’s Sports and Sushi Grill on Wednesday nights. Jones makes sure to mention his five-year-old son and twin two-year-old daughters before finishing the interview. “Everything I do is for my kids,” he said.